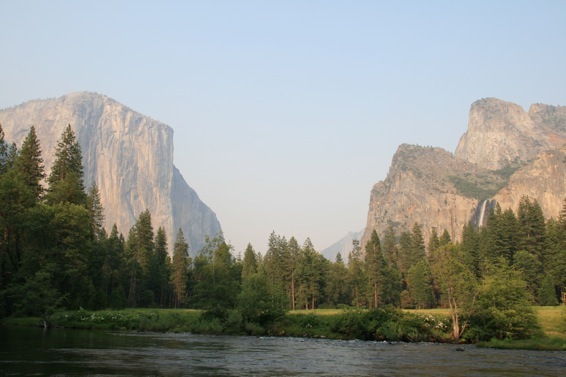 Yosemite is one of the best known National Park in the States, and certainly in California. And for good reason. We spent a fantastic week here, hiking and exploring. 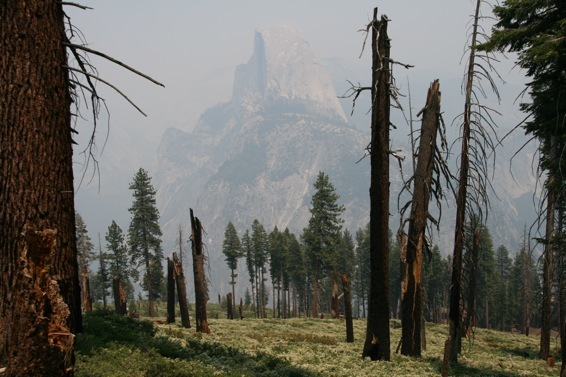 The main “sights” of Yosemite are very accessible – you don’t have to hike for hours/days to get the best views. In fact they assault you as soon as you enter the valley area. Soaring granite walls & domes, green meadows and forests of pines. We were a bit unlucky with visibility the first few days, due to the smoke from forest fires around the Park. It created a haze over the vistas. 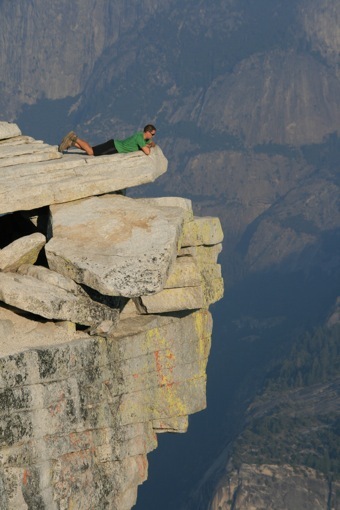 We spent two days hiking up Half Dome, from Glacier Point. We camped over night at Little Yosemite Valley, where Cathal got unbelievable mozzie bites while refilling our water bottles! The second day involved a 5.15am start. A 2 hour hike to the summit, including scaling some dodgy cables (can’t believe such a litigious country allows people to climb them! 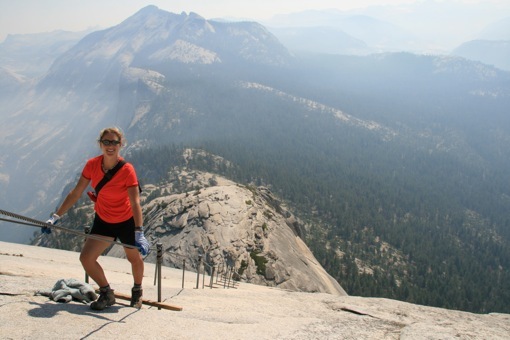 ), led to the granite top of Half Dome. We were lucky to have the summit to ourselves for 15 minutes or so, long before the day trippers got there. The smoke did affect the view, but it was still stunning. We cooked up porridge and starbucks coffee up there too. Cheeky marmots were hanging around to steal food – one got away with a huge bag of trailmix! En route back down we took a dip in the freezing cold river, took down the tent and made our way back to Glacier Point. The best thing about coming back after a hiking trip like that is how good the beer tastes! 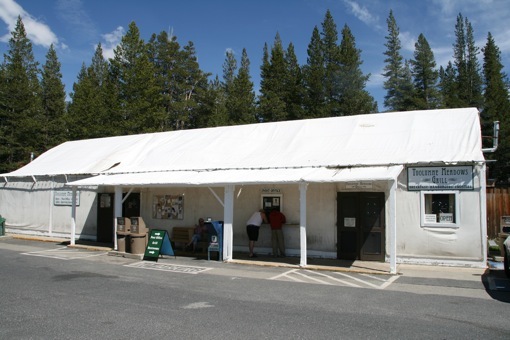 The tourist centre of Yosemite, the valley is strikingly beautiful. We were warned about the crowds at this super-popular place. The valley is indeed busy, but it is so big that it is quite easy to get away from the tour groups. 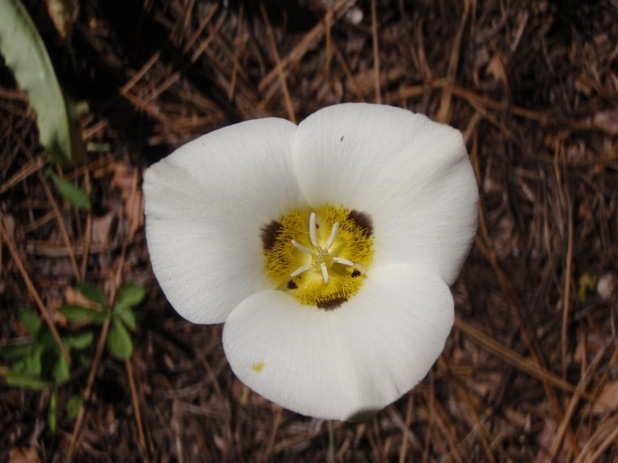 We thought of it as a gigantic city-park, somewhere quite distinct from the wilderness opportunities that Yosemite offers. We enjoyed two nights at Upper Pines campgrounds, rented bikes, had a beer at the beautiful Ahwanee Hotel (took adantage of their wifi! ), and chilled out by the river Merced. 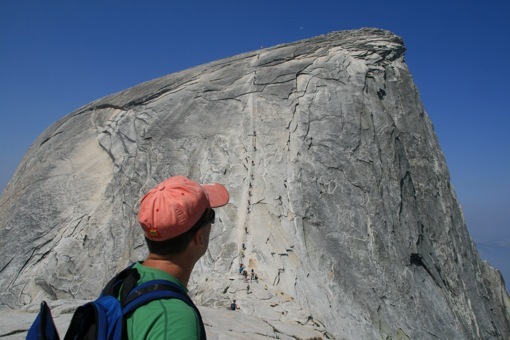 We took in sights such as the face of El Capitan, which takes up to 4 days to climb, Campground 4 where all the climbers stay, Bridalveil Falls, Mirror Lake, and everything else in between. Bears are a constant issue in Yosemite. Bears are clever animals, and they know that people equals food. 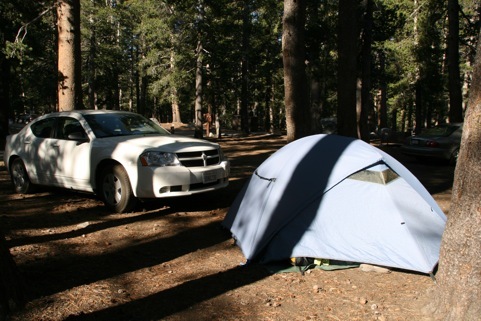 They often prowl the campsites at night, and will smash car windows if they get any whiff of something edible inside. 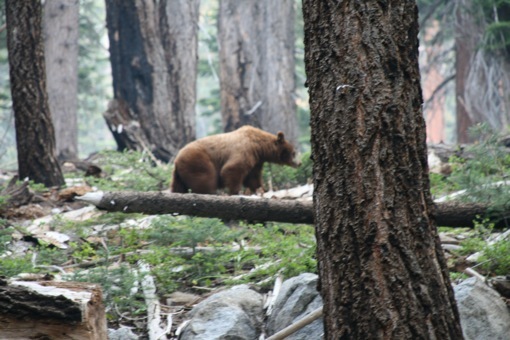 All food has to be kept in bear boxes, as described in the section in Kings Canyon. Black bears are supposedly easy to scare away, luckily we didn’t have to try! We left the valley behind and drove up the the Tuolumne Meadows area, 55 miles away. The higher we got, the clearer the views became. 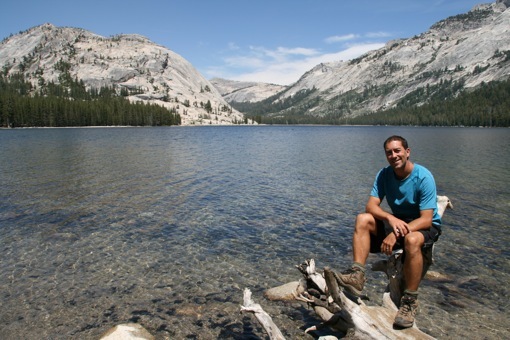 We saw stunning scenery, such as the view from Olmsted Point, Tenaya lake and the still-snowcapped peaks of the Sierra Nevada. As we neared the Meadows village our worst fears were confirmed – people were wearing long clothes and mosquito nets on their faces – not good! It proved to be not too bad at the campsite. 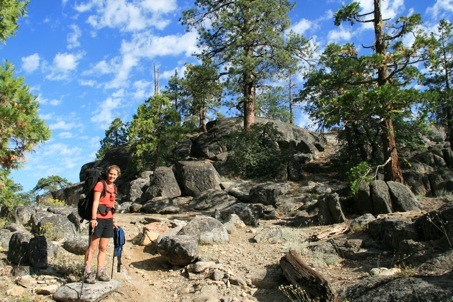 The next day we set off on a 3 day hike of Grand Canyon of the Tuolumne River. Several rangers had recommended it, so we were in for a treat. Day one saw us descending from the snowy peaks of the Meadows area, down through forest and granite expanses, and past three sets of stunning waterfalls. The temperature was pleasant, and the route was quiet. Such a contrast to the activity in the Valley area! We camped the first night at Return Creek. We had the little campground and fire pit to ourselves. We washed in the very cold water, relaxed on the rocks as the sun went down, and cooked by the fire. By cooking I really mean adding boiling water to “Backcountry Pantry” food, which we have dubbed “spacefood” due to the miraculous transformation of dodgy looking powder to quite a tasty meal. This trip was our first experience of using bear canisters. When in larger campsites, bear boxes are provided for storing your food. These are cemented to the ground and unpenetrable. 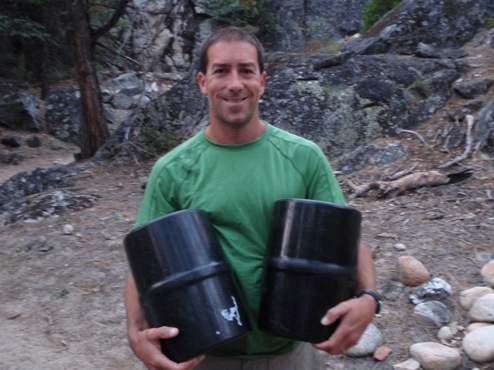 When out in the backcountry, you have to use canisters. 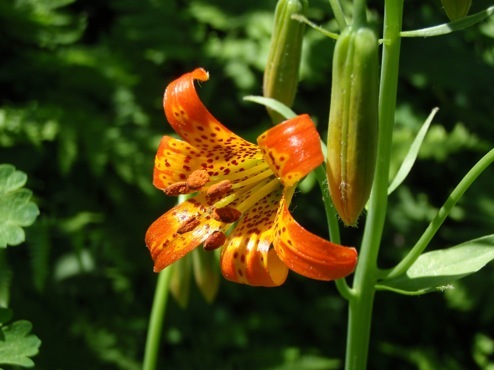 These must be sealed up and placed 100 feet from camp, and away from any rivers or cliffs. Bears can still smell the food inside, may come to investigate, but won’t be able to get at the contents and will soon lose interest. This very fact had us a bit on edge! Just before going to bed, we went to place the second canister with the other one. We talked loudly and banged sticks on the way, to scare off any animals. Just as we arrived to the designated place, we heard a big rustle in the bush, which was terrifying! We didn’t see anything, but were later told by a ranger that it was probably a bear as they know where all the campgrounds are! The next morning, however, our canisters were undistrurbed. We enjoyed a great day following the river into the canyon. We descended most of the day, which didn’t bode well for the uphill exit the following day! We had also been warned that few walkers get through this area without experiencing rattlesnakes. We were not disappointed on this front – we got quite a fright when we almost stumbled on a snake, which hissed and rattled at us in warning. 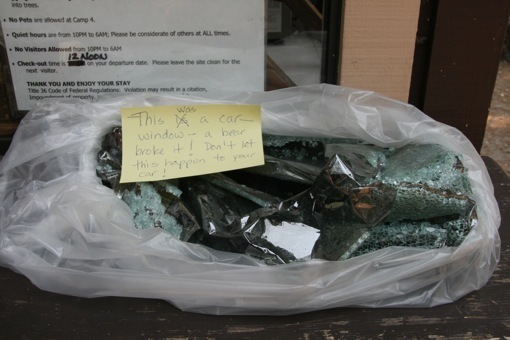 Luckily it slid quietly away. As did the second one we came across! We camped at Pate Valley, again beside the river. A spot of skinny dipping was almost overseen by the ranger, who came into view just as we donned our clothes! 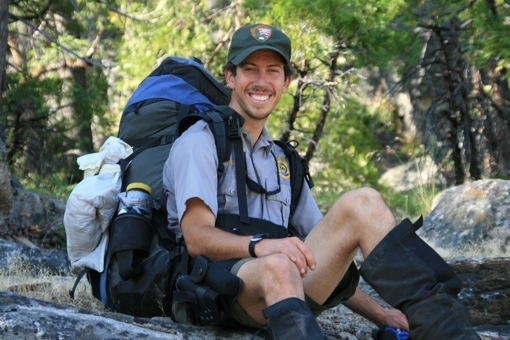 We got an early night, anticipating an early start, to avoid the heat of the day while hiking out of the canyon. We set off the next morning at 6.20am – amazing for us! And it was worth it. 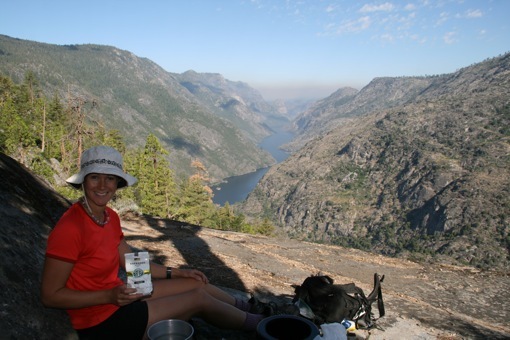 2.5 hours into the climb, we stopped at a bluff overlooking Hetch Hetchy Reservoir, the source of water for all of San Francisco. The view was clear, but you could see a smoke line on the horizon from the surrounding forest fires. It was a perfect place to cook up coffee and breakfast. Luke the ranger joined us here, and accompanied us for the rest of the hike. It made the climb seem much easier! What we learnt was that rangers have full police powers in the National Parks. Luke was carrying both a gun and a tasar! 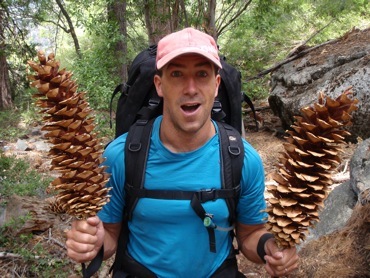 Another ranger had commented that these weapons were more effective on people than bears! We thoroughly enjoyed the hike, it had all the elements required – and a bit of bear danger to keep us on our toes! 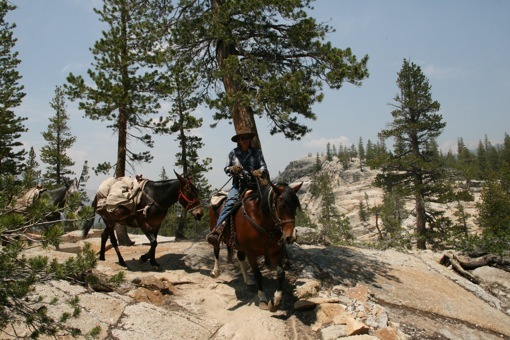 We were lucky enough to be hitch a ride easily from White Wolf, the end point, back to our car at Tuolumne. From here we collected our food from the bear box and headed up the Tioga road out of the park. 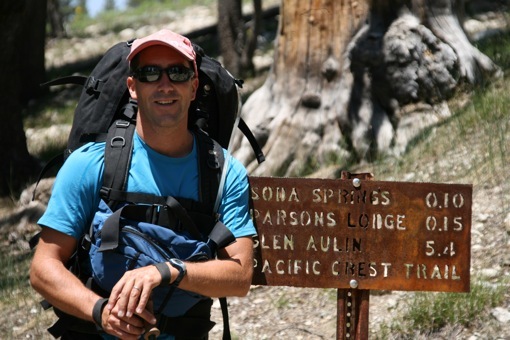 At Tuolumne Meadows we came across several hikers on the Pacific Crest Trail, a 6 month hiking marathon from Mexico to Canada. They post packages of supplies to themselves at various points along the trail. 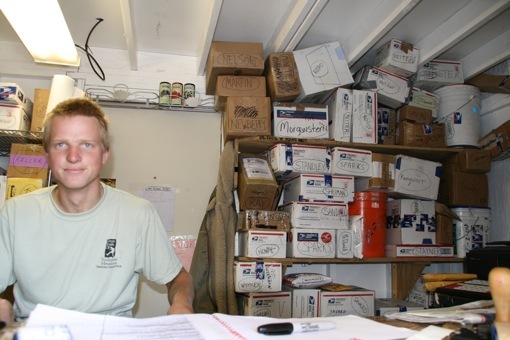 You can see these boxes stored in the post office here. Thanks for the lift Jay and Joy!